The County of Hawaii in collaboration with the State of Hawaii and private organizations are coordinating efforts for this year’s Fourth of July Celebration. The “2011 Hilo Bay Blast” will feature activities for families throughout the day at the Hilo Bayfront areas. Festivities will begin at 10am and will end with the traditional Lehua Jaycees Fireworks Exhibition Finale. Mass Transit will provide free shuttle service to various activity sites from 10am to 10pm. Parking will be available in the Downtown parking area near the Mo’oheau Bus Terminal, at the Afook Chinen Civic Auditorium and at the Hawaii County Aupuni Center. The shuttle route will run from the Civic Auditorium, through Banyan Drive and on to Kamehameha Avenue to the Mo’oheau Bus Terminal and back along Kamehameha Avenue up to the Aupuni Center on Pauahi Street. Patrons should wait for the shuttle at the bus shelters along the route. The Hilo Bay Cook-off competitors are set to fire up their grills at the Hilo Bayfront Commuter Parking lot adjacent to the Mo’oheau Ball Field. A multitude of flavors and aromas will tempt our taste buds with competitions in BBQ Beef, Chicken, Pork, Brisket and Chili. Judges from Texas will award trophies to the winners in three places. Coordinator, Rick Fredricks of Hawaiian Arts encourages private business and individuals to get a team together and participate in this event that is on its way to becoming the first sanctioned BBQ Contest on the Island and in the State of Hawaii. More information can be obtained by calling Rick at 935-1860. The “Hot Rides Expo” starts at 10am and will run until 5pm in the Mauka Soccer Field on Kamehameha Avenue. On display will be Classic Hot Rods and Drag Racing Vehicles courtesy of the Hawaii Classic Cruisers and Big Island Auto Club. An expected 200 plus show cars are scheduled to be part of this extravaganza that has attracted participants from throughout the State and Mainland every year. On stage at The Hot Rides Expo will be performances by Esther Zamora, The Boni & Doug Group, the Tomi Isobe Blues Band, Ol’ School Band and the Gin and Cronic Band. Sound and technical assistance will be provided by Pepe Romero of CJ Promotions. The show starts promptly at 10am and will continue to 4:30 pm. Food vendors offering plate lunches, sandwiches and a variety of goodies will be on site for the day’s festivities. The Mo’oheau Baseball Field will be home to various children’s games and contests hosted by the Parks & Recreation Department. Along with games there will be a Waterslide and Jumping Castle for youngsters to enjoy. The Mo’oheau Park Bandstand will be the site for interactive activities such as Zumba, Line Dancing and special performances by local groups. A “Kupuna & Ohana Comfort Station” area (located at the Makai Soccer Field on Kamehameha Avenue) will house a total of thirty 10’X10’ canopy tents which will available for use from 9am to 9pm, free of charge, on a first come basis. Tent space will be limited to one per family. Fire safety rules apply and no alcohol will be allowed. 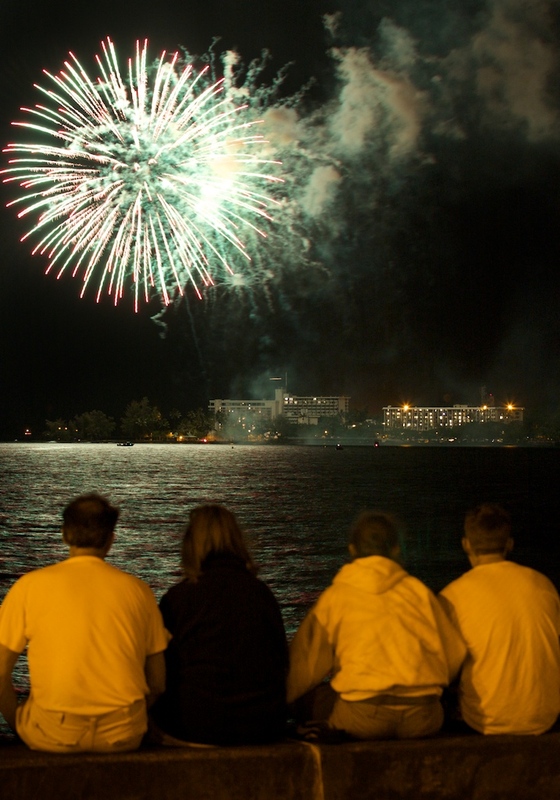 In an effort to make the Bayfront Shoreline accessible for prime fireworks viewing, the Bayfront Highway will be closed from 6pm to 10pm on July 4. Gates at the Mo’oheau Bus Terminal, Mo’oheau Park Ball Field and adjacent Soccer Field will be opened to allow access to this area during the fireworks exhibition. The Hawaii County Band will traditionally perform their 4th of July Concert in the Bandstand beginning at 7pm. According to Band Master, Paul Aceo, the concert will feature patriotic selections in celebration of Independence Day. The Lehua Jaycees will once again coordinate the Fireworks Exhibition from its traditional site at Moku Ola, Coconut Island and is set to begin at 8pm. The County of Hawaii would like to invite the public to attend this alcohol, drug and litter free event coordinated in collaboration with private enterprise, community organizations and government. Please remember that personal fireworks are prohibited at all beaches and parks. On behalf of the County of Hawaii, we thank the many community and government agencies that have worked cooperatively every year to make the Fourth of July celebration a safe and enjoyable event for all. Rules and application forms for the Hilo Bay Cook-Off competition are below. For more information, contact Roxcie L. Waltjen, Cultural Services Director, Culture & Community Arts Office, 961-8706.